A Literary Odyssey: Announcing October 2011 Group Reads. I'm in for Dracula! 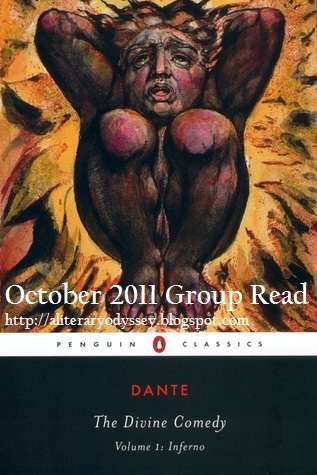 I will hopefully comment on Inferno, but I'm not planning to re-read it this fall. I like the idea of having a group of days when everyone can post--it seems to work out for other group reads I've watched and/or participated in. I've already read these two, so I won't be joining in. I did, however, want to reassure you that they are absolutely fantabulous! I really love both of these books, so I think you are in for a treat! I really like this way of doing it. It does take some stress off. I joined some of your readalongs in the past but I could never keep up with the posts. I would like to join the group for Dracula. It's been on my TBR for a while also. I'm not really in the mood for either of these at the moment but i fully support this new system and hopefully it is not too stressful for you either! I only write one blog post and I had a hard time trying to write more than that for readalongs (so that the second time I joined I only wrote at the end anyway). I'll definitely check out the posts though and may join in the future, perhaps 2012 will be a good year for me reading classics! ha. I want in for dracula. This will be my first group read....I'm in school so I hope I don't fall behind. I love this idea. My October is going to be crazy so I'll pass on this round. If you perhaps do another round, I'll be likely to join. I hope everyone enjoys it. I've been meaning to read Dracula forever. I'm looking forward to those posts. I'm a HUGE fan of The Inferno and personally think Robert Pinsky's translation is the best! I read Dracula in May and wasn't terribly impressed, though. :/ In any case, if you do the rest of the Divine Comedy later on, I'll join you for those, but I just read the other two this year so I will skip them for now. Your Dracula school project actually sounds kind of humorous, although I'm sure it wasn't at the time. Count me in for Dracula! I've had both of these books on my shelves for years (and years) but still haven't read either. Halloween is my favorite holiday and I ALWAYS read some kind of "scary" book in October so, guess what, I'm in for both! I've had Dracula on the TBR for AGES, so I'm shooting for that one. Ready to put it to bed. 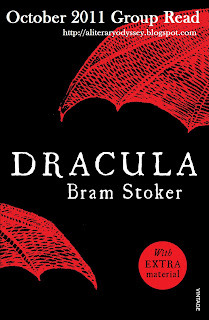 I can't wait to read DRACULA!! I'm that person who can't seem to get enough of vampires (but I can't seem to be able to make myself read a lot of the newer massed produced books. . .)This has been on my TBR list for a while; now I just have to find the box in which it is packed! Thanks for hosting this! I'm definitely in for Dracula- was planning on reading it for RIP anyway, so I can tie them both in together (cheeky... hehe). I have been a bailing out person in the past, and I definitely feel bad about it, so I'll make up for it with this, I promise! And don't stress! Hey, Allie! YAY for being back with the group reads! I am so excited! Count me in for Dracula! 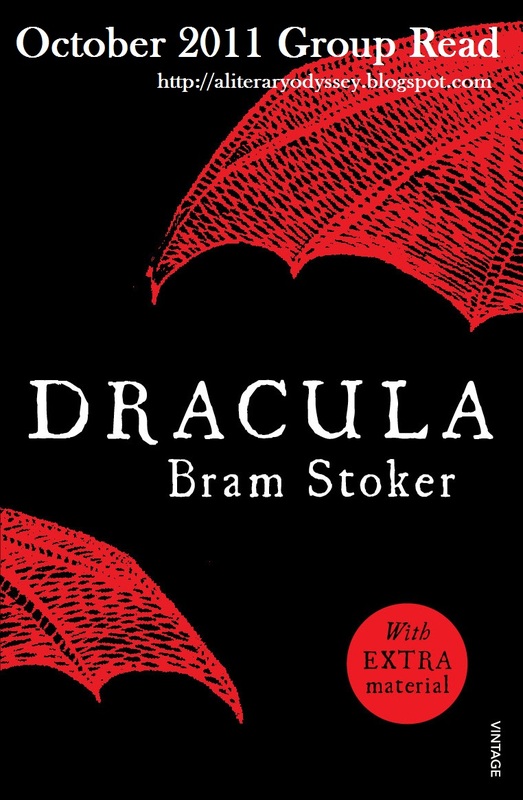 I've been wanting to read Dracula...count me in! I so want to join you in one of these! September and October have been eaten up by reading commitments, but I've decided to cut back on those significantly after my current batch so that I have more time to do things like this. I hope I'll get to join in for November, maybe. I've taken a much looser approach with my Reading Buddies project, and it seems to work. Having to post at several specific times can be stressful! I hope this approach works better for you. Count me in for Dracula!! My book club was going to read this this month, but the guy that was going to host it had to drop out, so it got shelved to possibly next year. I'm super excited about another read along. I kind of want to reserve a copy now! I'm in tentatively for Inferno, depending on how the month goes. Hi Allie! This sounds fantastic. I've been told to read Dracula many times now, and secretly I've been waiting for Halloween season. Count me in for both books! This sounds awesome! I have both books and haven't read them yet so I have no excuse not to jump in on both! I'm in for The Inferno! I've read Dracula semi-recently and don't feel like reading it again. I haven't read The Inferno since high school, where I struggled through it. So I'm going to get a new translation and hopefully it will go better this time! I love the idea of this new format for 'Group Reads'! Ok, you know what? I discovered my library has an audio edition with a narrator who seems good. I still have a ton of books to get through in the next month or so, but I'm going to try really hard to make Dracula one of them! I'm definitely up for Inferno - I've been meaning to read this for 10 years! I've finished reading Inferno, and first - thank you for this group challenge! So glad to have read it. Just put my post up - should I link here or wait for you to put seperate post up as you did with Dracula?